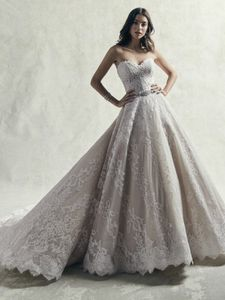 Description: Romantic lace motifs glide over tulle in this breathtaking ballgown princess wedding dress, accenting the strapless sweetheart neckline and hemline. Featuring a sheer back embellished in lace motifs and attached beaded belt accented in Swarovski crystals. Finished with crystal buttons over zipper closure.